x-nano™ UV Fluorescent Blue is an invisible ink featuring a blue fluorescence (em: 460nm) when exposed to UV light (ex: 360nm). The x-nano™ HP 45 IUV (TIJ 2.5) Cartridge is specifically designed for high-quality security Inkjet printing of checks, documents, photos, ID cards, authentications marks, and more using TIJ 2.5 HP SPS print heads. The unique properties of UV Fluorescent Blue are ideal for all security printing needs and applications requiring print of daylight invisible content. Images/marks printed with UV Blue only become visible in the presence of UV light, thereby providing any document with security authentication marks. Add invisible authentication marks to all of your business and personal printouts. Print hidden information on letters, clothing, a dinner-menu, business cards, lottery tickets, labels, cosmetics packaging and more. x-nano™ UV Fluorescent Blue invisible inks support many security related applications. This ink can be printed on media without interfering with other content printed on the same documents using regular visible ink. This helps reduce the need for additional print material, labels, tags, run-time, etc. and enables authentication of objects and items using UV (ultra violet) or IR (infra red) light. Invisible (fluorescent) inks provide a platform for endless industrial and security applications and inspire to creativity at home, work and associated with entertainment in sports (tickets), restaurants (menu) and other public places. x-nano™ invisible UV/IR fluorescent inks are suitable for all major inkjet printers and presses utilizing dot-on-demand inkjet technology. Authenticate Your Documents - The unique properties of the UV Fluorescent ink are ideal for the printing of authentication marks. Images printed with this ink become visible in the presence of UV light, thereby providing any document with authentication marks that prove origination and ownership. Protect Your Documents - Marks or images printed with UV Fluorescent ink provide documents with theft protection, anti-counterfeiting security, and thereby preventing fraud. Ideal for Any Document - Use UV Fluorescent ink to print authentication marks on any document including checks, tags, labels, ID cards, tickets, and more. 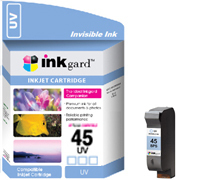 UV Blue is specifically formulated to be compatible with desktop inkjet printer cartridges. JetsFree™ - x-nano’s™ anti-clogging ink formula means fast, easy, and convenient printing every time. Eliminates time spent hassling with dried up, and caked nozzle surface or clogged cartridges. Ultra-Durable - Resists fading, smearing, and chemical alterations. Extremely stable against light exposure and chemical alteration. Images printed with UV Fluorescent ink remain invisible unless exposed to UV light. Environmentally Friendly - x-nano™ inks are made from natural ingredients that are non-harmful to the environment or one’s health.